It was 47 years ago, on a rainy fall Friday evening where I sat on the bench watching my team be frustrated by the other civil war rival from across town. It was the city’s biggest event of the year – the two high school football teams duking it out every fall before a standing room only crowd. On that night, we looked and acted like losers. I was angry that we were being “spanked” by those snobs from across town. I was angry with our quarterback, Gary, who was yelling at the other players, blaming them for our poor performance, acting like a jerk to everyone on the team including the coaches. Yea, I was just the second string quarterback, but I always believed I should have been first string in the first place and now I just wanted the ball. The best thing for our team now was to give me the ball and let me lead. It was early in the second half and I had had enough, as had some of the fans, as they began to get up and leave the 24 to nothing game. It was dark, damp, and kinda cold. Many believed that the outcome was determined; even many on our team I sensed were just waiting for the game to end. But not me, I wanted the ball. Assertively, and maybe even foolishly, I walked up to the coach and between plays said “I want the ball. I want to lead this. You have nothing to lose and maybe we can gain some self-respect.” He stared in disbelief that some “Junior” would say such a thing and told me to sit down. He was frustrated too it appeared. I didn’t expect this opportunity, but I wanted it. As I ran out to the huddle I thought of my dad and wished he could be there. Maybe he’ll hear it on the radio I hoped if he’s not too sick. It was sad that he would never see me play; his time was near. I put that aside as I entered the huddle. The guys were surprised and asked where Gary was. “Does it matter?” I looked each one of the guys in the eye and said, “I’m here to remind you that we are here to win. And I’m committed to being clear about what we are going to do, telling you when you’re doing good, what we need to improve, and simultaneously show you respect as we try our best to pull this out. Got it? Wolf 45 Right. Break,” I said as we broke huddle. All I remember of the first play is that it hurt. I was sacked. I could see Coach smirking on the sideline. Ted, the left tackle helped me up and apologized. “Sorry, I didn’t get leverage on him,” he said. “No problem Ted. Next time knock the crud out of him for me!” On the next series of plays, things were different. Ted did knock the linebacker down – again and again. And as we went through our progression of plays, everything seemed to slow down and become clearer. On the last play of the series, I remember running to the right in slow motion, finding a receiver crossing from left to right, and throwing a dart to him. Tom leaped up, grabbed the ball out of the air, turned, scampered 12 yards, and scored. The field seemed so clear and the play seemed to last for minutes even though it took seconds to narrow their lead to 17 points. As I trotted toward Coach after we scored, I could hear the crowd as did my team mates. There was a renewed gasping of hope in the air. And as I ran past Coach on the way back to the bench I again said to him, “I still want the ball.” He shook his head and I thought I saw him chuckle a bit. 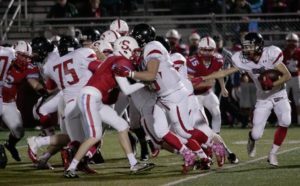 Our defense held – a “three and out” for the scumbags from South Salem. Maybe they were playing their second string offense now or maybe our confidence and effort was beginning to manifest itself. For me it meant that we had another chance to score and I had another chance to lead, to be responsible for the helping our team be successful, for building everyone’s confidence up, and being clear about what we were to go do. We needed to score quickly. Time was a factor. Coach listened and nodded his head. “Just call your game. Go no huddle if you want a few times. You’ve got the ball Kerper,” he said almost smiling. We huddled, I thanked my guys for working hard, and told them the strategy Coach and I had agreed to. And then I called the next 3 plays that we would run with no huddle. Again, everything slowed down even though I believe we were playing crisper and quicker than we had all night. The tactic was working. And we scored again in less than 3 minutes at the beginning of the fourth quarter on the counter play. Everyone knew the plan, everyone did their job, everyone accepted responsibility, and my hardest job was making sure I thanked everyone after we scored again for doing their jobs. We were within 10 points. The rest of the game was the “dog fight” of the season. They had a couple of good drives that we stopped eventually. Their great punter put us in poor field position twice. We got within 3 points after a long difficult 85 yard drive that was truly a “test of will” of both teams. What was cool about that drive was that we executed, we were efficient, we surprised them with our strategy, we outplayed them – we believed in our goal and in ourselves. We scored our 21st point with just a couple minutes left. As the game excitingly came to the end; we found ourselves short by 3 points. We didn’t reach our goal, but I’m proud of what our guys did that night. We won the second half and came very close to winning it all after having no points at half time. I took no “personal” credit for what had happened; the team deserves the credit. I wanted the ball and to lead, not because it would allow me to brag and increase my status among my peers or impress certain girls I fawned. What was happening was intended to create team success, team pride, and “team esteem”. My job as quarterback was to ensure everyone remembered the goal, to state the plan, ensure everyone knew their role, and treat them firmly and courteously as we executed each play. I wanted that job, to lead, to have the ball in my hands to help our team. “Coach, isn’t that what leaders do? Isn’t that what being quarterback is? Isn’t…uh…….” I stopped and looked down and I could feel tears. “Really coach, I’m not sure why. Maybe because if you have the ball, you have some influence, some impact over what happens………and I don’t have that at home……at the moment.” Coach fell silent, put his arm on my shoulder, and we walked silently to our cars. I just wanted the ball. Leaders are needed across the world and we are prepared to assist develop a new set of leaders for the challenges we all face. Call Misty River Consulting for assistance. We can help.